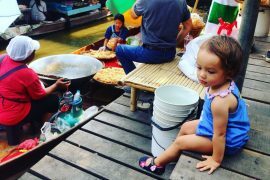 Visiting Bangkok for a weekend was just too short. Yet, it was still nice. But, that’s the art of living in Jakarta. U’ll never know what’s going to happen on your way to your destination. Anything could happen, car crash, bad traffic jam, anything… as if the city tries hard to ensure that no one would feel bored by living here. 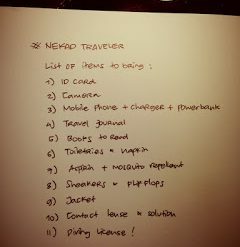 Hehehe.. yeah, Jakarta is full with surprises and it keeps our heart beats faster and faster. Chatuchak market was my today’s first destination! It’s a weekend market and has become Bangkok’s tourist destination when it comes to shopping department! 😀 The market is so huge and has thousands of shops that sell anything u want and need. Seriously. Anything. U named it. How to get there? Take MRT (underground train) direction to Bang Sue. 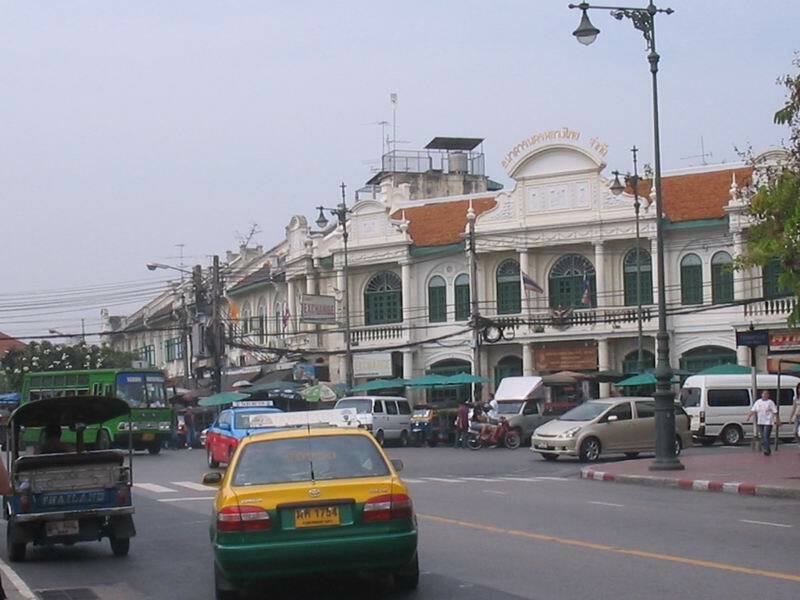 Stop at Kamphaeng Phet. As soon as you get out from the MRT station, you’re already in the market. I found a lot of cute shops located nearby the MRT station. One was panicking to see all the cute accessories and clothes! ;D I felt like I want to buy everything! Especially because everything was so cheap here!! OMIGOD… unbelievable. Panic. Panic. Panic. No wonder almost all my friends who have boutiques in Jakarta always shop in Bangkok. U guys earn a lot of profits, huh?! 😀 (hayooo ngakkuuuuuu!!) hahahha..
Chatuchak is a great place to shop. I love it. However, one could easily get lost here since the market is so huge. So, one practical tips from me: If you see something that you like, just buy it right away. Don’t ever think that u will come back again to that store, coz u’ll spend hours only to find the same store. The market is so confusing and you would feel disoriented right away. It has so many blocks that look similar to each other. And it’s unorganized, meaning that they didn’t categorize each block by the type of stuffs (e.g. furniture, clothings, souvenirs, etc). So, everything is just mixed up. Why the place is called “Bed Supper Club”? It’s because it has big sofas with big pillows where u can lay down (and sleep!) and relax… The idea of the place is that the visitors enjoy meals, starting from appetizer to dessert, completed with any kind of cocktails/wine/alcohol for drinks, before they start dancing ;). It reminds me of “Supper Club” in Amsterdam. 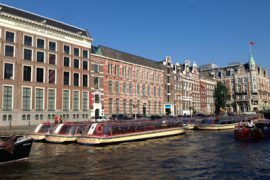 The idea is the same, but the one in Amsterdam is way much classier. You have to spend at least 100 Euro per visit, for the meals and few drinks, but if you’re an alcoholic, of course you’ll spend more! As for the “Bed Supper Club” in Bangkok, one has to pay 600 Baht for the entrance. When you’re in Pat Pong, be careful of any guys who try to persuade you to see the show. These guys will try hard to get you into his bar. They offer only 100 baht for watching the show, including first drink. But when you’re inside and already have your drinks, you’ll ended up paying 300 baht. The waitress will claim that 300 baht is the official price. They even show a price list. If we mentioned about our deal with the guys outside, these waitress will pretend that they don’t know those guys. This happened to us at “Super Pus*sy” bar. Late dinner at “Seafood Palace Restaurant” in Lumpini night market. The food was delicious. Nigel joined us. Had a nice chat together and all my friends like him a lot. Oyeah, if you want to go around and come back to your hotel, make sure that you bring your hotel’s address (the one with Thai characters), because a lot of taxi drivers in Bangkok don’t speak English. A lot of them are even illiterate. So, may the fortune be with you and you’re lucky enough to find an honest and sincere taxi driver to take you to the right hotel! 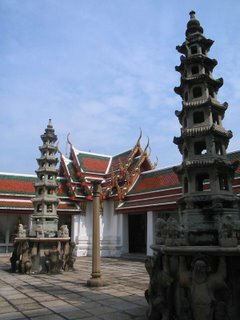 Wat Pho is a first grade royal monastery, regarded as the most important one during the reign of King Rama I of the Chakri Dynasti. 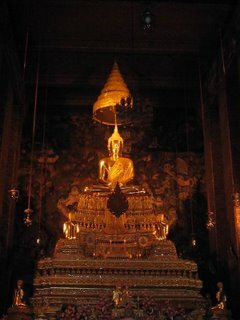 Some ashes of King Rama I were also kept under the pedestal of the principal Buddha image known as Phra Buddha Deva Patmakorn in the main chapel. It’s an important landmark in Thailand. One can enjoy the beautiful Buddhist fine arts (e.g. statues, etc) from ancient times. The entrance fee is nothing, only 20 baht. One can also see a lot of monks pass by and walk in the area of the monastery, because the place has two main quarters: the sacred (the chapel section) and the residential (the monk’s living section). 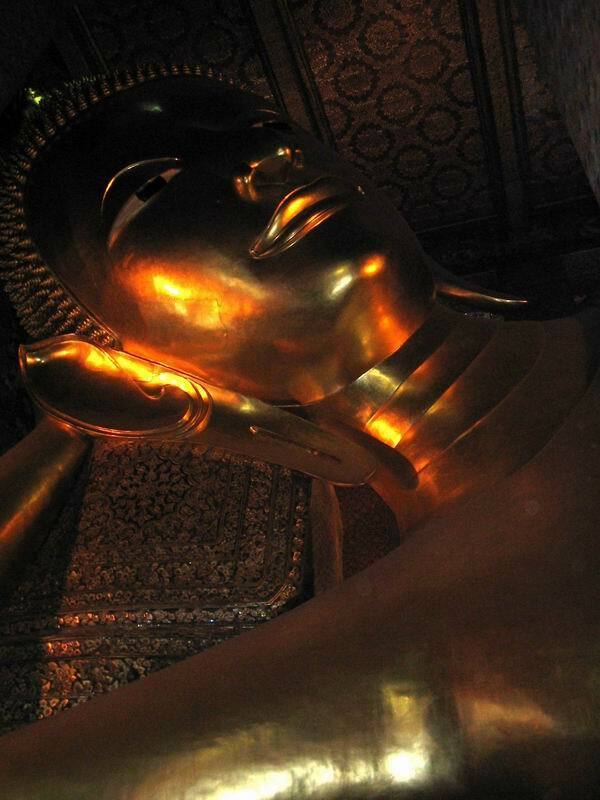 One should visit the Vihara of the Reclining Buddha in Wat Pho. 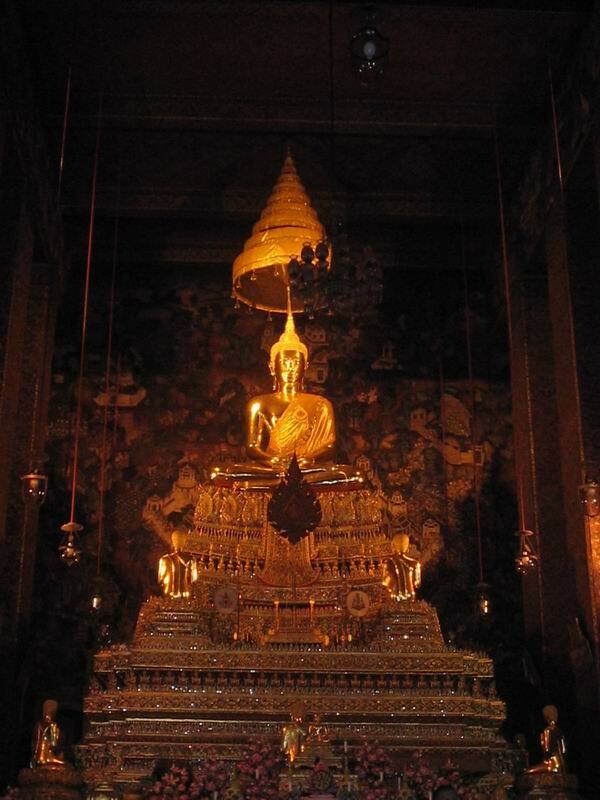 The vihara building is constructed for containing the important Buddha image, the Reclining Buddha. The statue is 46metres long, with the dimensions at the face of 15 metres high and at each food of 3 metres high and 5 metres long. WOW… IT’S HUGE!!! That was my first impression when seeing the statue. Not only that, the soles of the statue’s feet are inlaid with mother-of-pearl showing the 108 auspicious signs of the Buddha. This is the largest and most beautiful piece of fine arts of the reclining Buddha image in Thailand. Very astonishing. Since you’re in Thailand, don’t forget to try the Thai traditional massage. 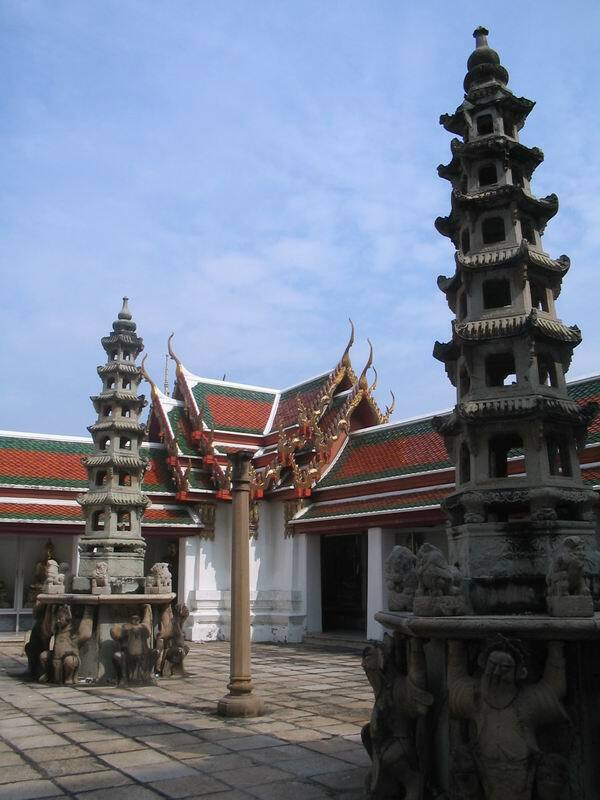 Fortunately, Wat Pho is also famous for its traditional Thai massage school. Wat Pho Thai Traditional Medical and Massage School is the first Thai Medical School under controlled of the Ministry of Education of Thailand. Nowadays, one can enjoy Thai traditional massage at Wat Pho. The service fee is 180 baht per 30 minutes; 300 baht for an hour. Try it or you’ll regret! I’ve tried it and it felt very good. Trust me. 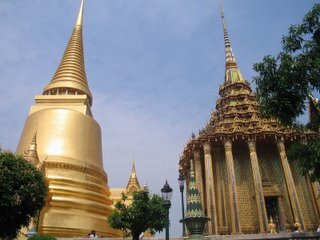 The Grand Palace complex was established in 1782 and it houses not only the royal residence and throne halls, but also a number of government offices as well as the renowned Temple of the Emerald Buddha. It covers an area of 218,000 square metres and is surrounded by four big white walls, 1900 metres in length. 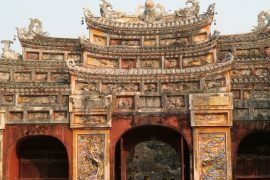 As soon as you enter the complex, you’ll feel overwhelmed to see the various buildings and temples in it. All of them are so gorgeous and stunning. 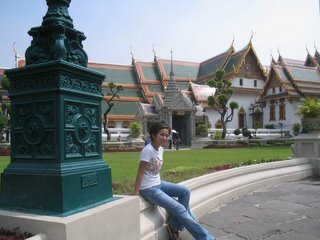 For those who’s seen “Anna and The King” movie, the setting was taken place here at the Grand Palace. J The complex is so beautiful and I’m glad that I made it there. Would love to bring Mom there. She’d love it, I’m sure :). A lot of tourists visited the Grand Palace when I was there. Of course, it’s not odd at all, since the complex is so dazzling. Tourists have to pay 250 baht for entrance fee, while it’s free for Thai. Fair enough :). Unfortunately, one cannot see the whole complex, though. Some parts of the complex are closed for public. 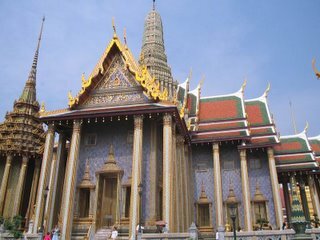 And, the main building of the Grand Palace was renovated, so I didn’t take any shot coz it didn’t look nice with all the constructions on every inch of the building.